Zadar, “Zara” for the Ancient Romans, is a small port town in the northern Dalmatian Coast. It is classically Croatian with blinding white marble streets, narrow alleyways, and charming cafes. The city is not exactly a “must-see” as the main attractions are few, but I chose to stay a few days to catch up on some reading, researching and relaxing. I covered all the tourist sites on my first afternoon stroll through town. The cathedral, the ancient forum, the sea organ which hums a few notes with every passing wave…check, check, and check. And just when I thought I had seen everything, I stumbled across a fast food joint that made me do a triple take. Identical in logo, color, and slogan; this was a photo opportunity not to be missed. Without a doubt, the internet has made the world a smaller place. 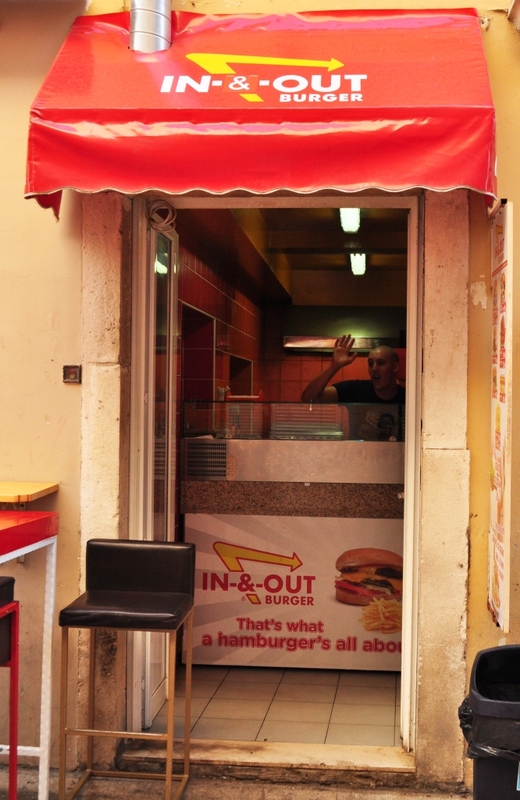 Because of it, we can now add In n’ Out to the list of Fast Food joints operating internationally. No, I didn’t eat there. Tempted as I was, I didn’t think it would quite live up to the name.